Our�Longest ATV grip. 5.75" long - a perfect fit for most ATVs with 7/8" handlebars. This�"Comfort-Sized" grip naturally reduce�hand and wrist stress. 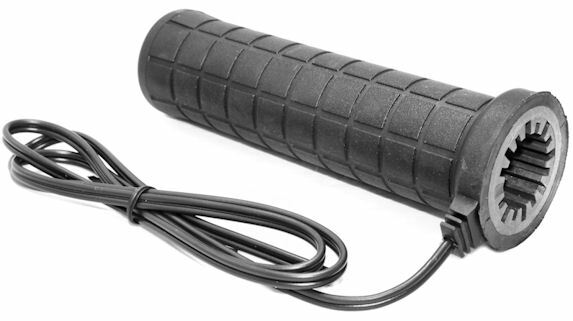 This grip is a bit larger�in diameter than most ATV grips and universally praised for its comfort whether the heat is on or off. Our�unique internal Heat Isolation Ribs reduce heat transfer to the handlebars and keeps the heat where it is needed - the rider's hands. Available with Open Ends to accomodate handguards or other accessories that�insert into the outer ends of your handlebars. CUSTOM OPTIONS - all our grips havewith a three position (high,low, off) weatherproof toggle switch. Optionally you can substitute a handlebar mounted switch,�mini toggle switch or infinitely variable heat controller.